Something Wrong With Your Gate? Call Us! Our Experts Can Repair Anything From The Hinges to the Opener! If your driveway gate isn’t working properly, there's an easy solution – call us. Whether there’s a problem with the opener, damage to the hinges, or the gate itself has come out of alignment, rest assured that the best technicians near you (meaning us!) will quickly set about to troubleshooting the system and solving whatever problem is affecting it. Working with major brands like Ramset, Doorking and All-O-Matic, allows us to provide high quality replacement parts that will work reliably for a long time. Many swing gates can come to suffer from damage to their hinges. This can be because of gradual wear and tear, the onset of rust, or can be the result of a sudden impact. In any case, whether the hinges developed serious cracks or fell off completely, some type of welding repairs may be required. That's definitely not something you'll want to attempt to do yourself, which is why you should leave this type of work to us – your friendly neighborhood gate repair experts. It doesn’t matter how well your gate works - if the intercom system experiences some issues, it will still be a hassle when you have to talk to a visitor waiting on the other side or when you have to "buzz them in". Without the intercom device working properly, you'll have to physically go to the gate to see who's there, which can often be extremely inconvenient. Luckily, intercom repair is another avenue of service Gate Repair Malibu is happy to provide. In fact, that’s not all. If you're looking to upgrade to a new wireless system or one that can sync up with your smartphone, that's another service specialty of ours. A common issue that comes up with automatic gate systems is a malfunctioning opener. This device varies from system to system, depending on weight, logistics and gate type (sliding vs swinging, for example). It takes a lot of skill and experience to be able to fix things like a broken articulated arm, or to know how to excavate an underground opener, complete the necessary repairs and then bury it back in the ground. When you suspect there's some type of mechanical or electrical problem with your opener, rest assured that by contacting us you'll get an affordable and fast solution. Need to have an urgent problem fixed? Want to schedule a service appointment for the weekend? Not a problem. 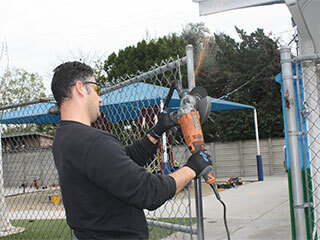 Gate Repair Malibu maintains a same day service policy Sunday through Saturday. You can always count on us when something goes wrong.